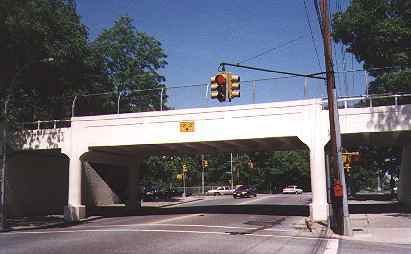 While making your way through the southeastern part of Flushing as you get close to Cunningham Park, you may spot the occasional white-painted overpass crossing the street. They’re not old railroad trestles or park paths…instead, they mark one of America’s very first parkways designed for automobile traffic. 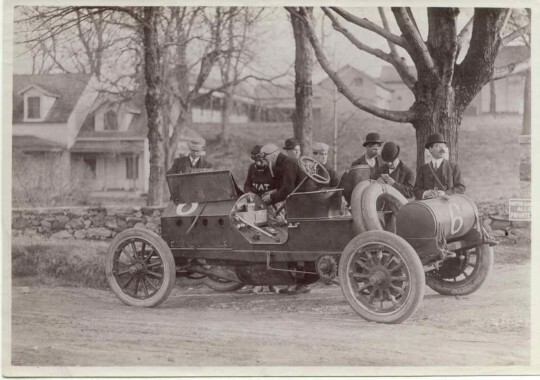 In 1904, the auto age had arrived in Long Island and industrialist heir William Kissam Vanderbilt helped ring it in with a road race that became known as the Vanderbilt Cup Race. It was one of the very first auto races and attracted drivers from the world over. The Cup Race was run in Nassau County on Jericho Turnpike, Bethpage Turnpike and Hempstead Turnpike–all now busy highways but in those days they were farm-to-market, unpaved roads. The race attracted thousands of spectators every year despite dangerous conditions that produced occasional fatalities among its participants. In 1906, after several spectators broke through a wire fence in Mineola, a race car smashed into a crowd, killing a spectator. Vanderbilt then decided that the Cup Race needed a separate course. The Motor Parkway viaduct crosses 73rd Avenue at 199th Street. After a persuasive public relations campaign, land in the middle part of Long Island from the Queens line to Lake Ronkonkoma was purchased, although enough farmers and landowners held out along the original proposed route to make the new Motor Parkway a twisting, turning route. (The Northern State and Interborough Parkways, which followed in subsequent decades, suffered from a similar malady). Construction began in June 1908 and eventually, the first phase of the Motor Parkway was completed in 1910. 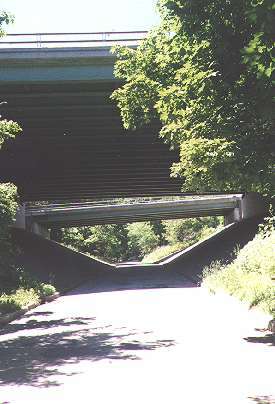 The Parkway pioneered the use of overpasses and bridges to avoid intersections with previously existing roads. 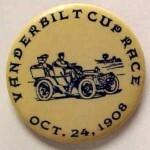 Tragedy, though, was a constant companion of the Vanderbilt Cup Race, and after the 1910 tilt, in which four people were killed and twenty injured, the race was never held again on Long Island. Indianapolis, Indiana became the national capital of auto racing. Vanderbilt, though, was still in good shape because the Motor Parkway was designed as a toll road as well as a race course, and contained 12 tollbooths along its 43-mile route. The Parkway was never subject to traffic jams in the early years, mainly because of its hefty freight. It cost $2 per tollbooth…a double digit amount in today’s money! Vanderbilt reduced the toll to one dollar by 1917, but that was still prohibitively high. By the 1920s, though, 150,000 vehicles used it annually. It was still the best-quality road in the area then, since the Northern and Southern State Parkways had yet to be built and Jericho and Hempstead Turnpikes were still two-lane farm roads. Vanderbilt continued to expand the Parkway westward, reaching Springfield Boulevard in 1911 and eventually, to Horace Harding Boulevard in what is now Fresh Meadows by 1926. Its final length was 45 miles. The Depression, combined with Robert Moses‘ aggressive road building, combined to doom the Parkway. Traffic was siphoned off the narrow Motor Parkway by Moses’ superior roads. Vanderbilt turned the Parkway over to New York State in 1938 in exchange for back taxes, without having made a cent of profit. “A white elephant for the past 20 years”, Moses called it. Though Suffolk County kept the easternmost 13 miles of the Motor Parkway for auto traffic, Nassau County has mostly used it as right of way for the Long Island Lighting Company, as it was then known. Small portions of its old route are still visible in Levittown and New Hyde Park, among other areas. It’s the Queens portion that concerns us here, since, by pure luck, it’s mostly intact! This Van Nostrand 1930 map of Queens shows the Motor Parkway’s Queens source at Horace Harding Boulevard (today’s Long Island Expressway) and Cross Island Boulevard (today’s Francis Lewis Boulevard). 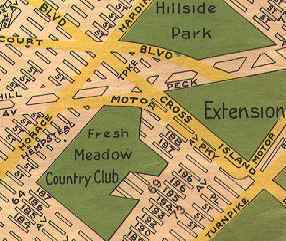 The Fresh Meadow County Club is today’s Fresh Meadows Houses, while Hillside Park is now called Cunningham Park. The Parkway was extended to its furthest westward length in 1926. This is on the 73rd Avenue overpass. 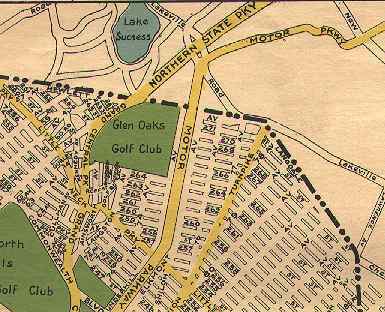 This portion of the same map shows the Motor Parkway in northeast Queens. After it was closed to traffic in 1938, Glen Oaks Village and Long Island Jewish Medical Center were built where it used to run. Apparently wishful thinking went into the preparation of many Queens maps of the 1930s, as developers rushed in to fill empty spaces. They only got populated after World War II, however. The Adriance farm, now the Queens Farm Museum, occupies much of he space north of the LIMP and west of Little Neck Parkway, where streets are shown on the map. 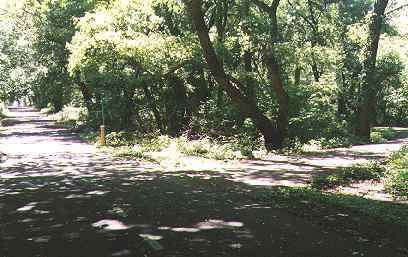 The old Motor Parkway is extant as a pedestrian and bike path from Cunningham Park east to Winchester Boulevard. At left it runs under Grand Central Parkway, and above, runs past Alley Pond. Today, the Motor Parkway is maintained by the New York City Parks Department, which keeps the foliage trimmed and removes any fallen branches after storms. 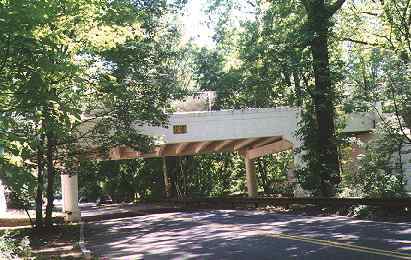 The overpass over Hollis Hills Terrace was renovated in 2000. 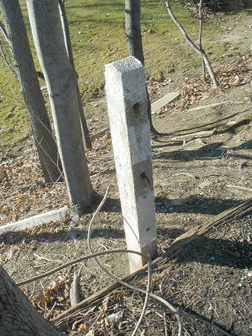 Left, entrance at 209th Street; right, one of the parkway’s original concrete posts that carried wire that kept cars from running off the road. A ‘fork in the road’: the right leads to Hollis Hills Terrace while the one at left goes over Francis Lewis Boulevard. Only the road at left is the true LIMP. Pressing on into Nassau County, we find remaining stretches of the Long Island Motor Parkway at intervals at New Hyde Park, Searingtown, East Williston and Mineola. 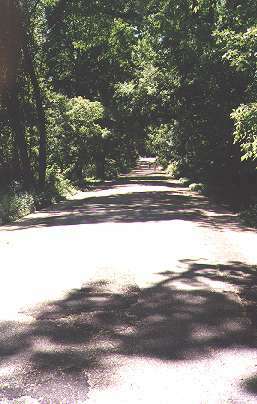 Old Courthouse Road is an old road that meanders through the communities of New Hyde Park and Herricks. Finally, it comes to an end north of Knolls Drive at a ruined bridge that takes it over the Long Island Motor Parkway. Above, the LIMP route looking west. 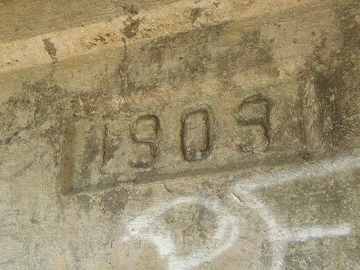 1909 stamp underneath the Old Courthouse Road bridge. Old Courthouse Road bridge as seen from the Long Island Motor Parkway. This section of the parkway is now used to route high tension lines. 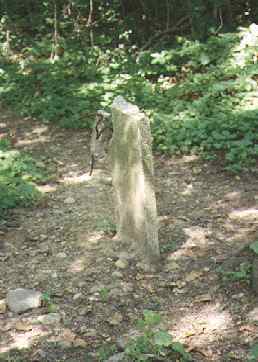 One of the remaining concrete posts on the bridge. At one time they held ropes that were not much protection. Auto route fencing has gone from ropes to wooden fences to aluminum over the decades. This leg of the LIMP (sorry) was completed between 1908 and 1910. Why is there a bridge here? Old Courthouse Road dead ends at the bridge, so why was it built over the LIMP in the first place? 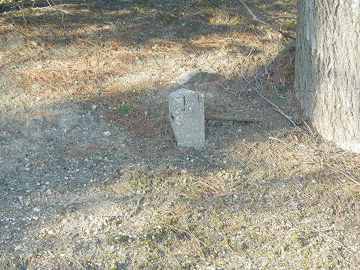 Moving a bit further east, we can see a very small fragment of the LIMP is the front yard of a new house at the junction of Searingtown and Old Searingtown Roads. 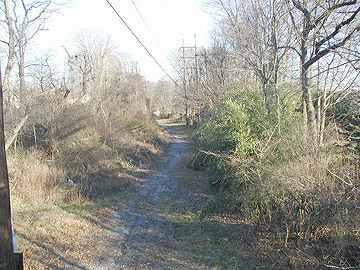 Until a few years ago this was a rare section of Nassau County that had been left untouched by suburban development. That has changed in recent years, but a remnant of an old pond, Lake St. George, can still be seen in nearby Herricks Park. A well-preserved portion of the LIMP can be spotted on either side of Willis Avenue a few blocks south of I.U. Willets Road and the Albertson LIRR station. Here we are technically straddling the boundary of Searingtown and Williston Park. My cousin, Forgotten Fan Tim King, discovers the LIMP on Willis Avenue. A clutch of old LIMP guardrail posts can be encountered on busy East Williston Avenue just south of the Wheatley Hills Golf Club and east of Roslyn Road. In the golf club, we’re told, are excellent preserved stretches of the ancient track. West of here, East Williston Avenue becomes Hillside Avenue and runs all the way west to Myrtle Avenue in Jamaica, Queens. 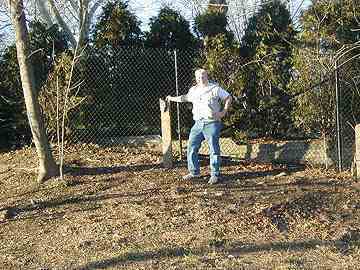 Tim’s father, Forgotten Fan Jim King, stands by an LIMP guardrail on East Williston Avenue. These rails do not mark the LIMP’s old path: they have been uprooted and moved here from their original position. According to some sources, this building on Rudolf Road and Donna Lane, just south of Jericho Turnpike (US25) near its confluence with the Northern State and Meadowbrook Parkways, is a remaining Long Island Motor Parkway toll house. 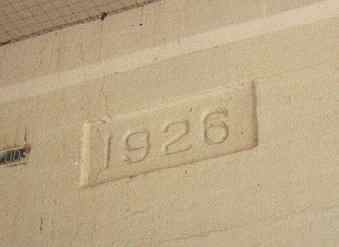 The LIMP stopped collecting tolls years before its 1938 closure, and this house has, of course, been altered a number of times since then. The LIMP ran in a general north-south direction east of this house. Its old right of way serves as the municipal boundary between Mineola and Carle Place. The LIMP doglegged east further south on its meandering journey to Lake Ronkonkoma. THAT’S SHOWBIZ. A selection of ancient Bronx theatres. What an interesting site and film! My family lived in Port Washington when I was little (born in 1945) then moved to Farmingdale in 1949. I remember my father showing me the portions of the parkway extant near Searingtown Road and as a kid rode my bike with my friends up Round Swamp Road to where parts of the parkway were in the ’50’s. And I recall once driving the Suffolk County part just as historian Miller did, as a young man. Glad to know it is part of the National Trust along with the beautiful Merritt Parkway in CT, where I now live. From ages 3 to 14, I lived at 170 Rudolf Road in Mineola, approximately 3 to 4 blocks from the house pictured at Rudolf and Donna Lane. I loved riding my bike on the deserted Old Motor Parkway between Mineola and Carle Place. THanks for the memory! I love the Old Motor Parkway as it winds thru Alley Pond Park. I bicycle on it with my daughter weekly. I think they should have more History Markers and Plaques along the way there. first concrete road built in the United States. I lived at 210 st in hollis hills (1940-1945). At that time the motor parkway was called the bicycle path. We would rent bikes at springfield blvd by alley pond park and ride the “bicycle path” for miles through beautiful wooded sections. Some of the motor parkway overpasses are still here. Fun to still see it on google maps. Thanks for info on the LI Motor Parkway. It is fascinating. I stumbled onto an original tollhouse in Garden City on Seventh St., opposite the Train Station and the AAA Building. We grew up in and around Lake Ronkonkoma in the 1960s. Our Mom told us the story of “Motor Parkway” but said the toll was 10 cents each way. Ooops! And from other people, I’ve heard the story of how Robert Moses “bullied the road system in New York”. 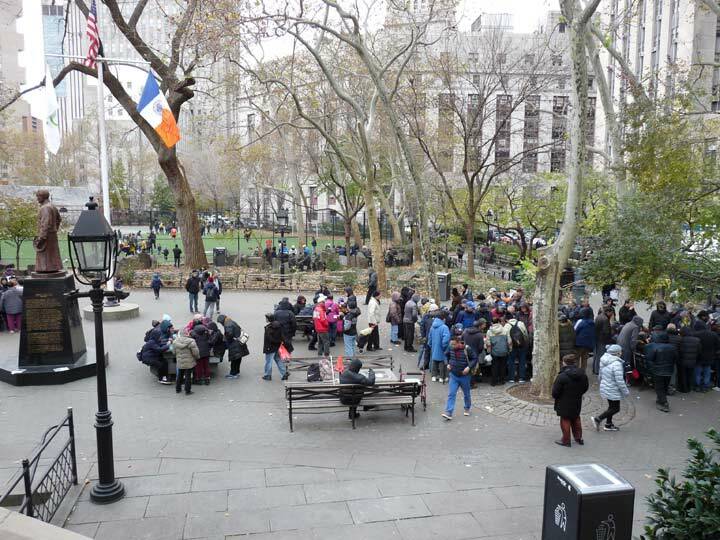 So interesting a story and unique to New York’s history. I rode many,many miles with my bicycle in the 1940’s on this wonderful old road The Lakeville Road exit ramp (Eastbound) was still intact and the toll lodge was in it’s original condition…has been vastly modified since. The Old Courthouse Road bridge….this went to private estates that were located just before the relatively new Northern State Parkway. 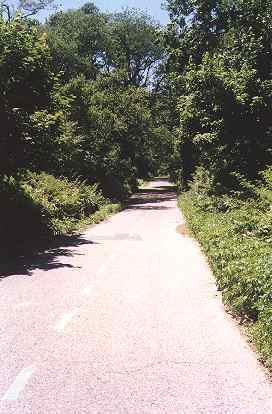 Further North was Powerhouse Road which was later transformed into a section of the Long Island Expressway. There was an intact bridge OVER the Northern State Parkway just a few hundred feet west of New Hyde Park Rd. before the Pkw’y was widened. I used to have my lunch there! Thanks!!!! Hi Hank I grew up in Williston Park and from about 7 to 10 years old in the early 60s old we hung out on that bridge that spanned the Oyster Bay line tracks and the surrounding woods putting pennies on the tracks and riding our bikes down the steep hill of the ” old motor parkway” as we called it toward Roslyn rd. In 1963 they built the Williston Park pool right on the parkway and later tore down the bridge. The parkway was deteriorated in those days with weeds growing through but you could still get a wild ride down that hill. I had a new light on my bike and a fast ride down that hill on the rough road shook it apart in no time. That was a different time no play dates or daily organized and controlled and institutionalized activities just free ranging kids who were ordered to be home by supper time. Those days are gone with the wind and the parkway.When asked by modern parents where I played as a child I always answer “on the railroad tracks” with looks of horror in response! I’m a Garden City resident and therefore am mostly interested in the western Nassau County aspect of the LIMP. So it appears the LIMP went in a general west-to-east direction from the present-day New Hyde Park Rd. Northern State Pkwy exit to where the old LIMP road is still visible by Willis Avenue. Shortly after, the road curved in a north-to-south direction so that it ran alongside present-day Northern State Pkwy and Meadowbrook Pkwy. After crossing over Old Country Rd, I believe it continued to run north-to-south in Garden City in between Russell Rd. and Pell Terrace, but this is merely speculation based on what Google Maps looks like. It then turned west-to-east again and crossed over Clinton Rd. (where there used to be a toll I believe), and continued onto present-day Vanderbilt Ct. in Garden City. After that there is an undeveloped sump area and then Roosevelt Field. It is unclear to me where the LIMP went from there. I grew up in Garden City .during the 60’s on Pell Terrace. Yes the Pkwy. did run between Russell Rd. and Pell Ter. We used to ride our mini bikes on that stretch of rode. It continued on across Old Country Rd. over a Rail Road bridge and past the land fill pit along side the Mineola pool. Voice Rd. off Glen Cove Rd. dead ended at the road next to the land fill. The Old Country Rd. crossing was were the garden apartments and the big office building stands now. Going in the opposite direction it crossed over Clinton Rd. just south of Pell. There was a hill on the east side of Clinton Rd. where the overpass would have crossed. There were remains of the road on top of that hill and the old gate house on the south side of the hill. I’m not sure if the house still stands. It then continued where the Roosevelt Field loop road was built. There was a section alongside the Meadowbrook Pkwy. on a corner of what was Mitchell Field. As a kid we rode our bicycles and mini bikes on those sections. Hope it helps. I know it brought back a lot of old memories for me. I grew up on Avalon Rd in the 60s-70s and used to cut through the backyards of the Pell Terrace Russel Road houses to get to Hemlock park and school. I never understood why those yards had that big, partially paved space in between them. We also used to ride our bikes and motor bikes up the hill on Clinton which was once the embankment of the Clinton Avenue Bridge. Funny to find out almost 50 years later what that all was. Wonderfully researched article, Kevin (and contributors), with a truly revealing film hosted by preservationist Robert Miller. I have always wondered about this beautiful parkway’s path and was elated to see what remains of it, functioning or otherwise. While Moses’ plans (for the Northern State Pkwy.) certainly could not be squashed, this underscores the wastefulness of society then and now. Progress (?) always comes at a price. At least Vanderbilt could not destroy domiciles. I remember a fine LGBT dance club with Sunday tea dances (Peaches? Cheeks?) overlooking Lake Ronkonkoma, probably just off the VMP. I grew up in Glen Oaks, Queens in the 60’s and 70’s. My grandfather used to take me to Alley Pond Park. I never knew as a kid that the path that we walked, and in later years I rode to the end by Cunningham Park, was actually Vanderbilt Motor Parkway. Now everything makes sense- the abrupt start/ end of the trail at Winchester Blvd at Union Tpke where the guardrail is, the concrete posts along the way and entrance ramps to the trail. Living in Glen Oaks, I lived right on the Vanderbilt Motor Parkway and never knew it. Now, I live in Suffolk and work in Melville. I get to drive along portions of the old road to work everyday. I work near one of the old underpasses. Its just amazing to see pieces of history- the US’s first superhighway. Thank you for your great video and great memories. the mineola pool in east mineola, wilson park. if u went to the pool and looked east. the pool was next to the mineola pit, which in the 60s had a baseball field then became a landfill. the ridge on the other side of the pit running north and south was the motor parkway. hello! i grew up in Williston Park by the old motor parkway in the 60 to 80’s ! but the road repaved by the village of Williston Park 70’s ! the original road had road mark every 50′ !! i met a gentleman when i was 12 & he had a story the old motor parkway one night he heard a crash in back yard & came out & found a car ran into garage & guy climbed out of the car & it was Groucho Marx & he was drunk & missed the Willis ave bridge !! Hi Tim, I grew up on the other side of the Old Motor Parkway in Albertson on Foxcroft Road in the 50’s to early 60’s. 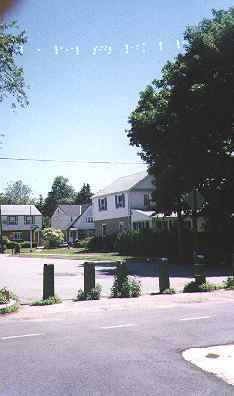 Foxcroft was a cul-de-sac that ended at the Parkway. 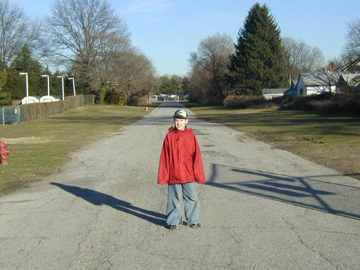 All the kids use to play on the deserted Parkway and we called it “the short cut road” because it was easy to venture into Williston Park to visit friends from there. Roslyn Road had a bridge across it at one time where the Parkway went across. When I lived there I just remember the huge drop off where the bridge use to be. I still remember all the cement road markers along the edge of the Old Motor Parkway. Great Long Island history. I was a small child in the 50’s and lived at 88 Evans Ave, Albertson, right near where you are describing. It was pretty flat there, but we used to go and play in sort of a hollow that was undeveloped except for the remnant of the Old Motor Parkway and there was some kind of big old building, maybe a barn. I am making a longer comment below. 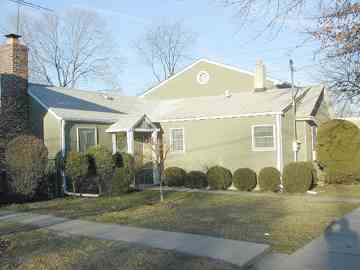 Hi, I grew up in East Meadow from 1951 to 1968 and lived on Old Westbury Road between Newbridge Rd. and Carmen Ave. We were the only house there in the early 50’s. 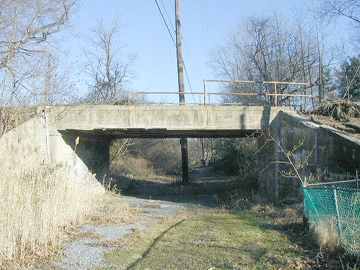 The Old Motor Pwy (OMP) bridge over Old Westbury Rd. was just west of our house. Many people used the roadway to dump trash off and I spent many hours rummaging through the trash looking for whatever. Levitt had a truck lubrication ramp south of the turn over the OMP bridge. Anf he had one of his tree nurseries east and adjacent to OMP. After the OMP bridge the roadway went NE over Wantagh Pwy that eventually ran right behind our house. The OMP continued on through the new Levittown development. When I was a little kid, I lived on Raff Ave in Mineola, a few blocks from the pictured house on Rudolf & Donna. I always wondered why Raff and the streets south of it were disconnected between Mineola and Carle Place. Raff was especially odd because the 2 ends of the road were quite close together, separated by a big guard rail and a short steep hill. I remember my dad saying that the path which ran south to Westbury ave was something related to Vanderbilt. I don’t recall if it was passable going north from Raff to Jericho tpk, even when I was a kid. But we certainly rode bikes south. I grew up at 400 Nassau Blvd, Mineola in the ’40s, about 200′ south of the Williston line. My sister & I got our bikes in 1948 and once I mastered it, we went for “bike rides”… Discovered the “Old Motor Parkway” and that was our route of choice. Mom & Dad absolutely forbid us from going there … however, that was probably the ONE edict I really disobeyed. It was a peaceful ride, unhampered by traffic. We rarely encountered anyone and when we did, we just kept going to be on the safer side. There were only a few overpasses that were in tact on the parts we traveled. We had to walk our bikes down, cross the road, and walk them back up the other side to continue our ride. I remember being able to see them building the UN building @ Lake Success from the OMP, and later speculating about the people coming and going there. There was a boy scout camp along the roadway at one point, and when it wasn’t occupied, it afforded us a comfort stop as we used the outhouse there. I remember something scrawled on the wall in one: “Our aim is to keep this place clean, your aim will help.” (The things that stick in your mind!) 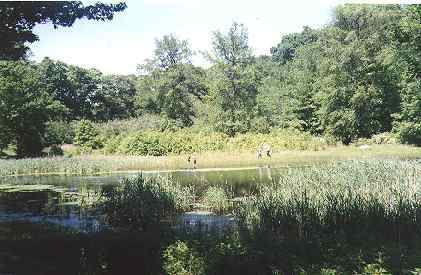 One of the places along the way was a pond of sorts, not far from the LIRR track in E Williston, north of Hillside Ave. Caught our first tadpoles there. (Mom was NOT pleased with them!) I thing this pond was situated behind an empty, Victorian home (we called it the haunted house) that gave us the creeps. Today, I’d probably want to explore it, but i’ts probably been replaced with a split level! ….. Thanks for helping me remember a care-free time … Today’s my 79th birthday! Great input. That old Victorian home you’re speaking of in East Williston has been razed. It is now a park. Just north of there is a sump that has standing water. I wonder if this is the pond you’re speaking of. I grew up in Bayside back in the ’50’s by Bell Blvd & 67th Ave. One of my favorite bike rides was to ride my Schwinn up Bell Blvd to what my dad referred to as the “Vanderbuilt Pkwy”. Some days I’d head east to Alley Pond Park, other times I’d head west to Cunningham Park. Those were the days my friend! It’s a shame an 8 or 9 year old can’t experience that alone these days. I grew up living next to VMP off of 222nd St. during the late 1940’s to late 1950’s. Use to bicycle to Alley Pond Park for baseball, tennis, handball and fishing at the ponds. At Springfield Blvd, there was and entrance and exit ramp to the parkway. Great piece of history by Bob Miller. I lived at 88 Evans Ave in Albertson in the 50’s when I was around 8 and remember playing in a hollow or depression that was undeveloped. It had the mysterious road in it and they told me it was “The Old Motor Parkway” We loved it and were not supposed to go there but went there a lot anyway. I remember it being lined with trees and there was some kind of building. I think that section ended in a development. This is a 60 year old memory. Charlene (above) says she lived near there on Foxcroft Ave and that may have been where we went, but looking at the map I would have thought it might be where the map shows the Henry Viscardi school now. Does anyone know? There was a sand mining pit in the location you speak of. It was smack in the middle of that part of albertson. To this day the development there is visibly haphazard because that pit was eventually filled in but the roads are all weird. Thank you Bob Miller for a great film and very interesting information on the VMP. I grew up in Bayside in the 50’s and 60’s and clearly remember riding my bike East on the VMP from Springfield Blvd to Winchester Blvd. Then we would turn around and head West to Bell Blvd on the VMP and then finally back home (46th Ave and Bell Blvd). What a great, carefree time it was, especially in the 50’s. Even after I graduated from college (1973) my friend and I would ride bicycles on the same route on the VMP. Thank you again Bob Miller for a fantastic walk down memory lane. In the early 1950’s I was a kid, and we lived at 54 Stevedore Lane in Levittown, between Bloomingdale Lane and Jerusalem Avenue. I believe the Old Motor Parkway remnants were behind our backyard (now a large sump) and we could go in there. It was parallel to Stevedore Lane. I think I remember the remains of a crashed small plane on it. It was like a tree covered lot and I don’t remember much else. 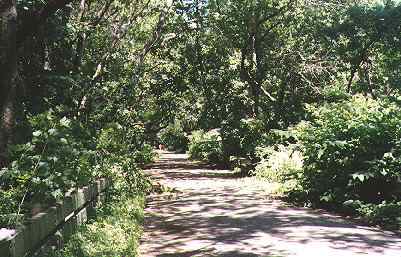 Backyards of Stevedore Lane is Motor Parkway right-of-way. Here is a link to the map. From there was an overpass (over the road) which had been partly filled in. so we had to climb again to get over the piles of dirt. That was circa 1952 or 3. when I look now on Google Earth, it appears to have been obliterated.